The departement of the Alpes Maritimes - Pop. 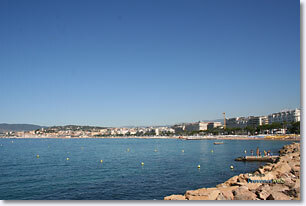 : 73.383 h.
On Highway A8 and N7, 29 km from Nice Internation Airport. 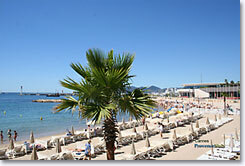 150 years ago Cannes was nothing more than an unimportant fishing village. 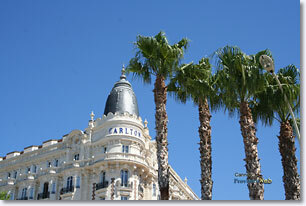 Since then it has become an elegant city known round the world and attracts an international clientele. One gets to the top of the city by climbing the Mont Chevalier up to Suquet. 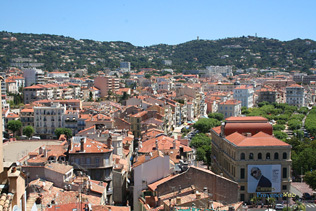 The panorama at the top is breath-taking with the whole city below surrounded by the blue sea and the Lérins Islands. Following narrow streets down to the market of ForviIle and through the plane tree lined streets of Liberté, one arrives back at sea level. All along the Quai St Pierre in the old port one can find fishing boats and pleasure boats side by side. The fishermen work on their nets next to their colorful barks. 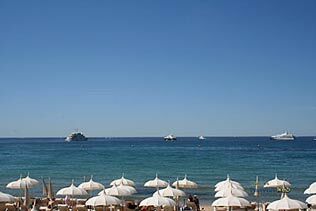 On the pier Albert Edouard the most beautiful yachts in the world come to moor. Looking out to sea one can perceive the islands of Ste Marguerite and Ste Honorat which are accessible by boat in 20 minutes. Full of life from morning to night this street has shops of every sort. 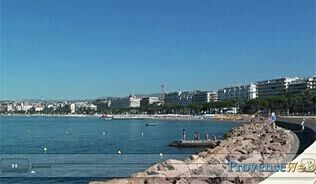 This fabulous structure, capable of housing all kinds of assemblies, has propelled Cannes into becoming the second most popular convention town in France. 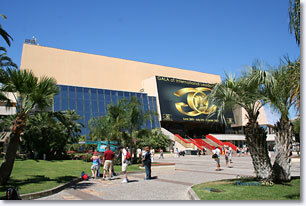 The International Film Festival is held here, as well as, the MIDEM (congress of record producers), concerts of classical music, dance and theater. There are even four casinos. 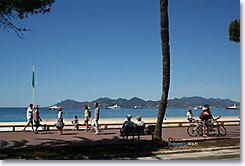 This is one of the most famous promenades in the world. 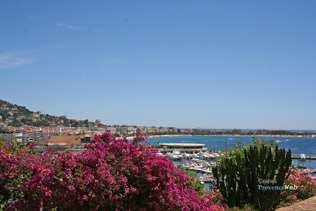 For three kilometers following the curve of the bay one can see flowering gardens, lawns planted with palm trees, umbrella pines and other trees all the way to Port Canto, Palm Beach and a sea water health spa. 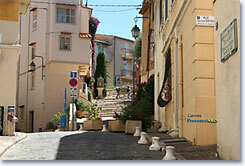 Strollers can find their way back to the center by taking the renowned rue d'Antibes. Notre Dame de l'Esperance. The Russian church Alexandre III. The chapels Bellini, Ste Anne, Notre Dame de la Paix, St Georges. Villa- Musée Jean Gabriel Domergue. 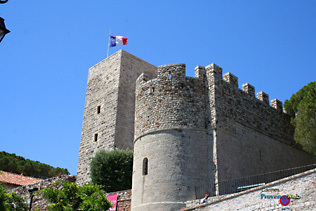 Musée de la Castre, Musée de la mer. Malmaison. The park Roseraie. The garden Alexandre III. Public and private sand beaches. The Royal Regatta in September. Flower, fruit and vegetable markets. RESID'HOTEL Resort. Apartments for 2 to 4 persons. Le Cannet (2km), Mandelieu La Napoule (10km).